Every year November I dedicate a small piece of this blog to the guys or maybe not and that’s when I create awareness on prostate/testicular cancer. You can read my previous posts here and here. This year I was unable to attend the Movember event like I did last year, due to exams so I guess I have to find another way to support the cause. Its definitely that time of the year where the men in your life are allowed to grow their facial hair without you complaining. 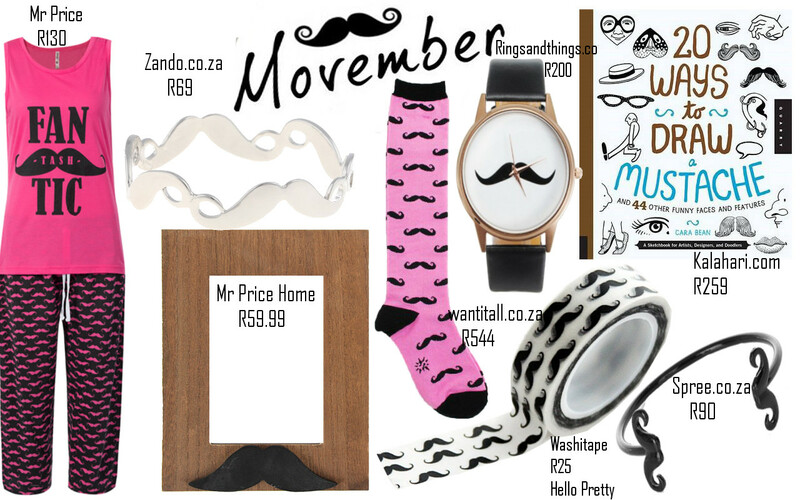 Movember is an initiative that support men that suffers from prostate/testicular cancer. In the month of November, men grow their beards, stache, tash, mustache. Whatever you would like to call it, to show their support. Obviously us girls need to find a different way to show our support so I’ve compiled a list of awesome goodies that you can purchase (I know I would love all of them) and show the men in your lives that you support them! If you’re not into that, you could always check out the Movember South Africa website to see how you can donate. Guys remember: early detection is key! Tags: Kalahari, Movember, Mr Price Home, November, Ringsandthings, Spree, Support, wantitall.co.za, Zando. Bookmark the permalink.